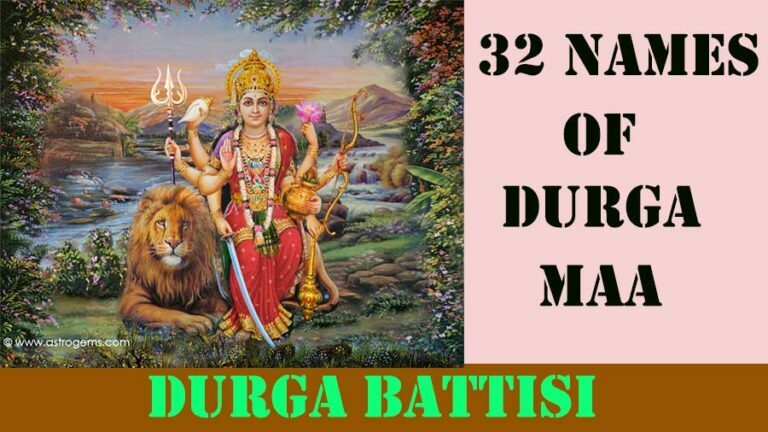 The 32 Names of Goddess Durga are also known as Durga Battisi (दुर्गा बत्तीसी). These 32 names of Mother Durga have been taken from the spiritual book – Durga Saptasati. It is said in Hindu mythology that Durga Battisi Japa (constant repetition) brings an end to all difficulties in one’s life. Regular chanting of 32 names of Mother Durga is immensely powerful, and by doing so, the devotee is blessed by Mother Durga herself and is freed from all kinds of fear in life.